Stone shaft, top half of south view. 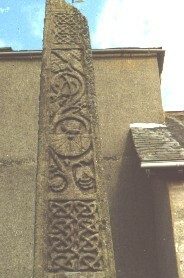 View of top half of south face of stone shaft, dated to the first half of the eighth century. This side is edged by broad outer and fine inner roll mouldings. The panel at the top is not clear. The next panel has an interlace pattern. The third panel has a complex plant trail springing from a single root. There is a sundial attached like a large leaf to the stem of this. The next panel has a single register of outward-facing patterns with knots.